Each candle is accompanied with detailed burning instructions. Please follow these instructions in order to create a well, or cavity in the top of your candle. Once the well is established, a clear, uncolored votive candle should be used to refill your candle, allowing you to enjoy its soft glow for countless hours to come. Cut wick to ¼” before lighting candle for the first time, and every time thereafter. The wick must be kept trimmed to approximately ¼” at all times. If allowed to become longer than this, it will have a tendency to curl over sideways, creating an egg-shaped well rather than the preferred round one. If you do not keep the wick trimmed short, it is possible that you may burn through the side of your candle! So this is an important step! Once the well in your candle has reached about 2-3” in depth, stop burning your carved candle and use a clear votive candle as a refill. If colored votives are used, the glowing effect will be diminished. Never leave your burning candle unattended! If this sounds like a lot of work to you, we now have good news! You can request that we “Pre-drill” your well for an addtional $5.00. 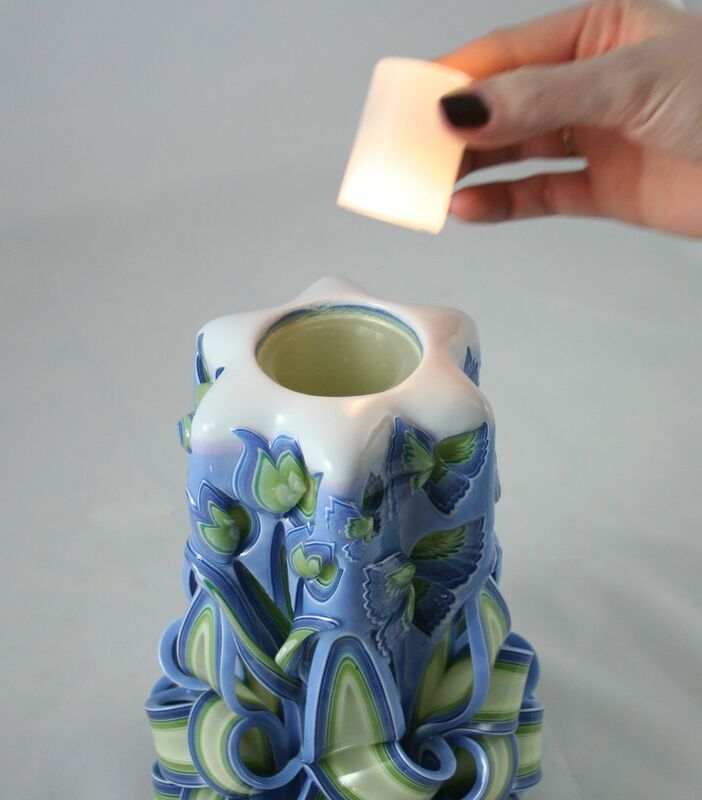 Then you can use a votive candle right away, or better yet, order one of our original LED kits for your new candle. We have developed our very own LEDs that glow at both the top and the bottom, so they fully illuminate your candle. And you never have to purchase batteries for our LEDs, they come with their very own charging cord. *Burning instructions are for all of our wider top candles. We do not recommend burning our narrow top candles (Cut-n-Curl and Pineapple) if you want to preserve them. Above, you can compare a candle with a pre-drilled well to a candle without a pre-drilled well. Allowing us to pre-drill the well in your candle allows you to use our convenient dual headed flickering LED votive insert right away! Your candle is made of wax, and will be damaged if dropped or bumped against hard surfaces. Please use care in handling. A thin layer of acrylic glaze has been added to the outside of your candle to discourage dust from clinging or embedding itself into the surface. 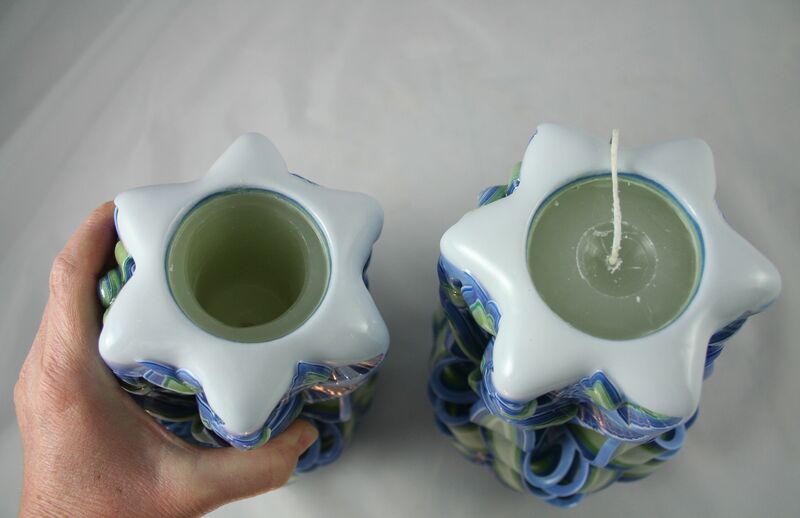 If your candle should ever need dusting, rinse with clear, cold water. Never use harsh detergents on the surface of your candle, as that may damage the glaze. Store candles in a cool place in your home, never in the attic!